Ah, don't cha love Netflix? I do, and one reason I love it so much is that I can revisit past favorites. 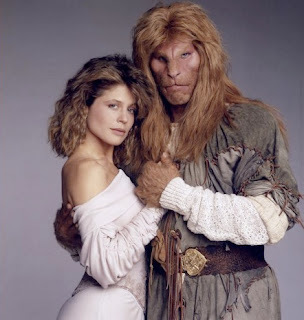 Lately, I have been watching Linda Hamilton's Beauty opposite the impeccable Ron Perlman's Beast. While the short-lived television series made each of them famous, Perlman's career has been more varied and probably more lucrative. In a recent interview, he stated he had been in 15 films this year. Of course, Hamilton repeated her Sarah Conner role in Terminator 2—Judgment Day, as well as successful films such as Dante's Peak. The pilot for this modern treatment of the fairy tale sets up the story, as lovely lawyer Catherine Chandler is the victim of a savage attack. Vincent, the Beast who lurks in darkness, saves the the damsel in distress, and introduces her to a labyrinth of tunnels below New York City, and to the people who dwell there. Although I knew the series was set in New York City, but I did not realize how much New York is not just the setting, but a via shining cityscapes and location shots, it is really a co-star. When Vincent needs to rescue Catherine, a frequent occurrence, he rides atop subway trains and traverses tunnels beneath the city. As an assistant district attorney, Catherine alternately assists the downtrodden and fights to rid the streets of criminals; indeed, some of the plots are drawn from issues facing NYC in the late 80s, such as corporate harassment of tenants in rent controlled apartment buildings. The scripts for Beauty and the Beast are by George R. R. Martin, a well-known scifi/fantasy writer, and fantasy elements abound. From the first episode, Vincent feels a "bond" for Catherine, and he knows when she is in danger, a necessary aspect to keep him in the above ground action. When I originally saw the series, the cinematography was impressive for television. 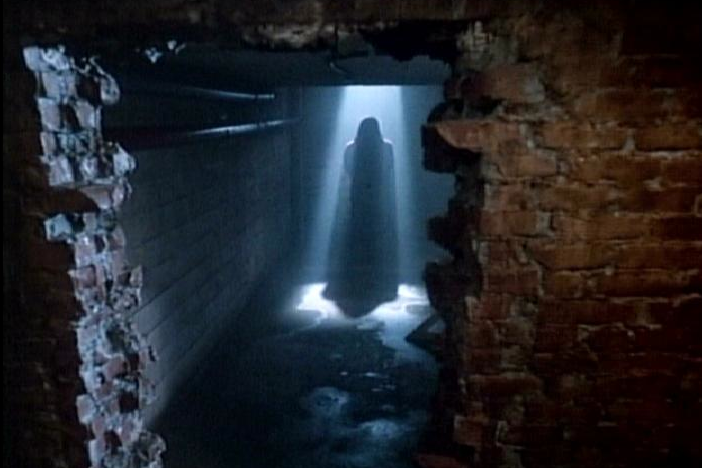 While it has not aged well, there are still some impressive shots, painting the setting with light. Catherine's extensive wardrobe and make-up help create her "Beauty" persona. Linda Hamilton's Sarah Conner character in the Terminator films was not nearly so glamorous. Perlman no doubt spent many hours in the make-up chair to portray Vincent, but the results are still impressive. When he roars at attackers, his leonine look and rugged wardrobe are quite beastly, but his soft voice and precise diction when he reads poetry are enough to melt my crotchety old English teacher's heart. Online, there are numerous sites for fans to visit, and I was especially impressed with the artistic renderings of Vincent and Catherine posted to various sites, but those are generally not for reposting. There is also fan fiction, and a few conventions have been held, too. Obviously, I am not the only one who enjoys this modern fantasy. You are definitely right about the many sites dedicated to this wonderful show! The group I am involved in meets yearly to celebrate the show and we were together this past July in New Orleans and will meet next July in Dallas. Although the numbers are not huge (usually around 100), our voices are mighty and we continue to talk about and share our love of Catherine, Vincent and the rest of the cast. As a matter of fact, I am about to share the link to your blog with my group so get ready for some responses! By the way, I loved what you wrote! Thanks for stopping by, Joyce. I hope that you and your group continues to spread the word about this version of Beauty and the Beast. While it was popular when originally telecast, it deserves to be introduced to a new generation. Lovely blog article, Pam. My English Lit loving heart fell in love with the show because of the the literary references - and Vincent being hot didn't hurt! That voice reading Shakespeare... *sigh* 20-odd years later, I'm still loving Vincent and Catherine, and it seems unlikely to change any time soon! Gosh, I still love it, love it, love it! Joyce did share and thank you for writing this. The dream does continue, as fresh and bright as it ever was. Oh and by the way, that probably wasn't all SPAM...LOL! We do love to share our BATB sites. Thanks, Janet, for your kind words. I appreciate all of your thoughts and comments. Feel free to share this post with all BATB fans! Thank you Pam for remembering our Vincent and Catherine. The wonderful acting by everyone in the series, the magic and chemistry between Ron Perlman and Linda Hamilton introduced me to a show that I felt portrayed what real love should be. It's just too sad it ended the way it did. Over 20 years later and it still breaks my heart. Oh to have just one movie with the original cast to end it as a fairy tale should end. Are the television Gods listening? You are welcome. I have certainly been enjoying the series all over again, and it certainly deserved a better end than the final episodes. I wonder how it would be rebooted, if some of the same minds that rebooted Star Trek and Battlestar Galactica got involved. What a warm tribute to a phenomenal television show! The devoted fan base for B&B holds an online (virtual) convention every February where hundreds participate, we have our annual conventions, and as you noted, have multiple websites celebrating our show. The show is both inspirational and aspirational - truly a remarkable achievement by Ron Koslow, his cast, writers and crew. B&B even has its own bench in Central Park! George RR Martin only contributed to a few episodes, rather than the whole series. The pilot is a script by the show's producer Ron Koslow. Also for anyone who hadn't seen the show before, I feel strongly about making sure they know that it was much, much more than a "danger-rescue, damsel in distress" show... though the first half of season 1 may have done a lot to set that general perception. Only some 10 or 12 out of the 44 episodes are anything of the sort. Catherine is a strong character, and her growing and awareness of that strength is one of the fascinating things about it... at least to me! And yes, like Joyce said, it's more than a few conventions: They have been held every year since 1988; next year will be in Dallas. It's always nice to find someone who not only enjoyed the show, but rejoiced in the poetry of it. You're not alone. Since you mentioned art and fan fiction, you should visit with fans from all over the globe at Winterfest Online - a 9 day celebration of creativity. Here's the link to last year's. This coming year, WFOL begins February 4th. Hope to see you there. I didn't realize there is a B&B bench in Central Park. I would have looked for it when I visited, had I known. Oh yes, the bench! Here it is, if you'd like to take a look... or for next time's visit! What a lovely article you've written :) I found the series as a teenager, and rediscovered my love for it as an adult. I've met such wonderful people through fandom (most of your previous commenters, for one) and what strikes me about the series, even now, is how timeless its themes are. Leaving aside the bad 80s hair and the ginormous shoulder pads, these are stories about being strong in the face of adversity, of living and loving and trying to sustain a relationship when everyone and everything seems to be saying "You shouldn't." And um...Vincent reading Shakespeare (or anything, really) still has the power to make me stop cold in my tracks. Thank you all for your comments and additional information. When I chose this topic, I had no idea that so many fans would respond. Yes, despite the "big" hair, dated fashions, and older automobiles, the themes in Beauty and the Beast are timeless. I really liked your article about this show. As a fantasy fan I saw that show when it was first broadcast and Though it wasn't exactly what I had expected I fell in love with the style and atmosphere of the show. Then when I heard it was coming out on DVD I went onto the web to find out when and was surprised at how many fan sites I discovered. It is a beautiful and inspirational show. Thank You for your warm article regarding the amazing components that comprised this lovely treasure. I discovered this series when it originally aired in 1987 and have followed it with my heart all through my life. I am a Classic Fan. It was lovely to discover there was a Batb Community through the websites and videos, and although I found fandom in 2007, it wasn't until last year , when I saw a con video that expressed, "Sometimes we must leave our safe places..." did I emerge from my shy shell to participate in the Batb Community through discussion boards, WinterFest Online and possibly attending my first Convention next year. The Batb Community has enriched my life in so many ways, not only through the creative artistry, but more importantly for me, through the shared humanity that "Even the greatest darkness is nothing, so long as we share the light..." Vincent and Catherine, and the Tunnel Community represent strength, compassion,humanity and the beauty of art, music, poetry and intelligence; that it is truly wonderful the "Dream is Kept Alive" through the creative caring of the wonderful Batb Community that is still going strong! Again, thanks for all of the comments on my post. There are certainly a great number of fans of this show, even after a couple of decades, and that is what defines a "classic." I am glad that so many of you chose to read my ramblings about Beauty and the Beast. Thanks for your lovely article. I too was "smitten by the Beast" as it were when it first came out in 1987, and my 27 year old son rediscovered it for me through his love for the show. Who could not fall in love with the brilliant mind, quiet and sensitive demeanor and those leonine features, cerulean blue eyes, thick blonde mane of hair and velvety poet's voice? Thanks for promoting our favorite couple. If you fast forward to 2007, Ron Koslow brought another couple with similar differences to the small screen. Both shows suffered from Writer's strikes and grew phenomenal fan bases. Thanks again, fans of Beauty and the Beast. I'm glad you stopped by Pam's Pages. If you haven't already done so, check out some of the interviews from that era, as Ron Perlman and Linda Hamilton discuss the show. One of my favorites is a YouTube video of Perlmans acceptance speech for best actor in a television series. I miss the show. I was born in '81 so I ended up watching wit my mother. We both loved it, but since I was a kid, it was probably for different reasons. I did enjoy it so much though. Thanks for sharing. I've been being spammed with comments promoting other sites, so I have enabled moderation. Friendly comments are always welcome, however. Best Buy or Worst Buy?